Robert Pattinson in Costume Fittings for Bel Ami? 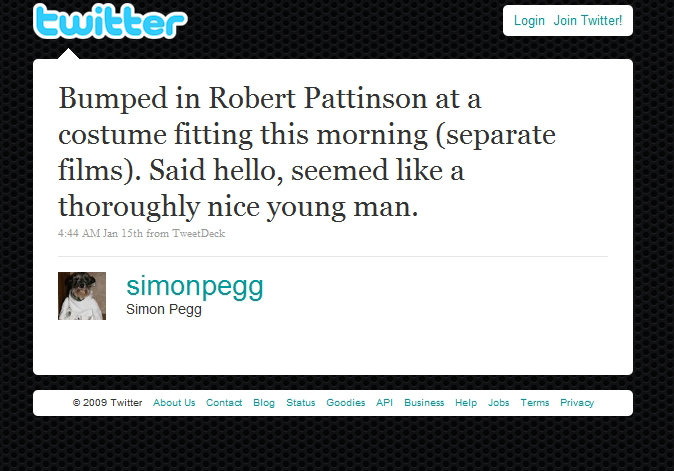 Actor Simon Pegg reported via his verified twitter page on January 15 at 4:44am est (9:44am in UK) that he had run into Robert Pattinson while in for a costume fitting. More than likely Rob was going in for some preliminary costume meetings for the period piece Bel Ami. Can’t wait to see Rob in late 1800’s suits and coats, scrumptious, um no mustache though blarg. One Response to "Robert Pattinson in Costume Fittings for Bel Ami?"